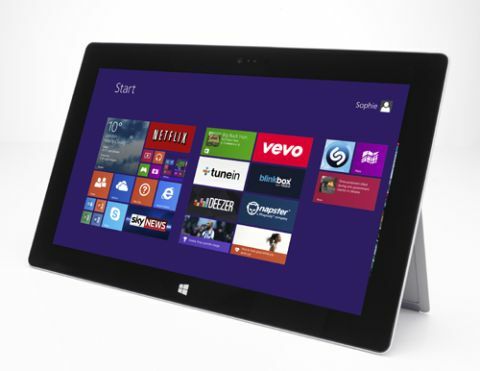 Microsoft Surface 2 review | What Hi-Fi? The tablet designed to let you work as hard as you play is back for another round. The Surface 2 is Microsoft’s second attempt to convince us that a tablet offering Microsoft Office, Outlook and access to Windows Store apps is worth the price of an iPad. It will have to offer plenty of improvements over the previous model, not to mention the new tablets incoming from MWC 2014, such as the Sony Xperia Z2 Tablet. The original Surface RT failed to ignite our interest, but the second-generation design has come out all guns blazing. For starters, Microsoft has swapped out last year’s 720p screen for a Full HD display, increased the tablet’s power and improved battery life. It’s a great start, but we hope there’s more. One aspect that stays largely the same as the previous device is the Surface’s design. The ‘2’ is built from the same good-looking magnesium alloy as its predecessor, has the same flawless finish and it feels very solid indeed, if not the easiest tablet to handle. Its thicker, taller and heavier than most, including the skinny iPad Air, and feels strange in portrait mode thanks to the 16:9 ratio of the 10.6in screen and the resultant weight balance. Still, this Surface sequel works much better when combined with one of the available snap-on keyboards. Here, there is a new kickstand built into the back of the tablet itself – this one has two angles (20 and 40 degrees) to prop up the Surface 2 when typing. This is an improvement but we still prefer the hinged dock of Asus’ Transformer series, which acts more like a sturdy mini laptop. Unless you’re really looking to save millimetres, we’d choose the Type Cover keyboard option (£110) – it’s backlit and has real, mechanical keys. The Touch Cover is just 2.75mm thick but with no depth to the ‘keys’, drumming on the pad can feel strangely unsatisfying. Microsoft has added or improved a whole raft of thoughtful features and specs. The USB 3.0 port on the right hand edge of the tablet will prove very useful if you plan to ditch your laptop entirely. The 3.5MP front-facing camera serves regular Skype callers well with light-adjusting tricks that make dark living rooms look brighter to the person you’re talking to. There’s a decent 5MP rear-facing camera too but we doubt you’ll be taking many snaps with this 676g slab of Windows. Speaking of Windows, Microsoft is sticking to its guns with the RT version of its latest operating system here. There’s no access to full programs downloaded from the internet, such as the desktop version of Spotify. Instead, there are pre-installed Microsoft programs including Word, Excel, PowerPoint and Outlook and access to the Windows Store. This is a bit of a shame and ultimately why the Surface 2 isn’t as tempting as it first appears. The silver lining is the improved version of the OS in the form of Windows 8.1. This update keeps the split between the large touch-friendly Start tiles and the desktop mode used to run Office. But it adds better splitscreen multi-tasking and improved search functionality powered by Bing. Plus the Start button – missing from Windows 8 – has returned, albeit to push you back to your Tiles. It boots quickly, working with Office is fuss-free and swiping upwards or from the right of the screen to access apps plus settings and sharing menus becomes second nature after a matter of days. Performance isn’t perfect though. It’s frustrating that the Surface 2 can only run a limited number of apps simultaneously. Equally, 8.1 hasn’t ironed out all the kinks – there are still two versions of the Internet Explorer web browser, for instance. If you’re new to tablets, stick to iOS or Android as navigation can get confusing. Video downloads and streaming are taken care of by Xbox Video and Netflix – available as a third-party app download from the Windows Store. Xbox Video can be found on the main Start screen of tiles and offers both movies and TV shows to buy or rent in SD and HD. Music options include Spotify, which is available on the Windows Store, and Microsoft’s own Xbox Music. There’s no real reason to use it over Spotify but the catalogue is vast so it’s worth a look and there are radio and free streaming options. The Windows app store is ticking along nicely but if the App Store looked back now, it would seem a mere speck on the horizon as Microsoft attempts to catch up. BBC iPlayer is still missing, which is unforgivable on a tablet. Furthermore, iPad owners are spoilt for choice when it comes to music, movie and photography apps. Surface 2 owners are not. The Surface 2 has been treated to a Full HD screen, with a boost in colour reproduction, but the world has moved on. It’s a decent 10.6in screen – 16:9 movies fill it nicely – and a big improvement on last year’s effort, which produced a soft, washed-out picture. But load up the Surface 2 with Elysium in 1080p and the iPad looks much crisper, with more refinement between similar colours and textures and bags more depth to the picture. Try streaming the Netflix documentary The Short Game and it’s clear the Surface 2 offers up good contrast and great viewing angles. However you tilt that kickstand, the golf courses look nice and vivid. But again, with a more natural colour palette and sharper edges, the iPad is a much more inviting watch. It’s very easy to get your own high-quality files onto the Surface 2 but once they’re ready, and you’ve plugged in some decent headphones, you’ll find they sound somewhat pedestrian compared with playback on superior rivals. Daft Punk’s Derezzed sounds clear, precise and expressive on the iPad and altogether boring and sonically squashed on the Surface 2. Sparser tracks fare better, with vocals sounding listenable enough on Jonsi’s Go but again the Surface 2 struggles to produce a sound that’s as direct as elsewhere. The Dolby Digital Plus stereo speakers are located at the top of each side, so you won’t cover them up just by holding the tablet, and they sound decent considering. They also go very loud, albeit with a little distortion at higher volumes. Full Windows 8.1 needs to be let loose on the Surface 2 to make it a real alternative to the attractiveness of iOS and Android tablets. Until then, this is something of a poor man’s iPad. There’s no doubt the Surface 2 is more geared to work-related use and if this is what you want from a tablet, then it’s a tidy option that offers decent entertainment features for playtime. But we’re in the sound-and-vision business and, with only mediocre picture quality and disappointing sound, the Surface 2 can’t tempt our wallet form our pocket.